As Spanish explorers spread their customs around the world, the las arras matrimoniales (wedding coins) ceremony became an integral part of the marriage vows in many cultures. The ritual is still widely practiced in Spain and most of Latin America as well as in the Philippines and U.S. Latino communities. The foundation of this tradition emerged in the Roman and Greek cultures where a piece of silver or gold was broken in half whenever an arrabon (pledge) was made. During a wedding, the groom and bride each took one half. Over the centuries, the gifting of the coins during the marriage ceremony evolved into a symbol of the groom's dowry -- his unwavering commitment to provide for his new family. The 13 coins carry multiple meanings and vary by culture. Generally, the symbolic gesture communicates the couple's trust in each other to share the responsibility of managing the household finances. The groom makes a pledge to provide for his family while the bride vows to honor the blessings God has put into their lives. Presented to the groom by an honored padrinos or madrinas (godparent) and blessed by el padre (priest), the coins are also a good luck token to ensure the couple will never be without money. It is also said that each coin represents continued prosperity for each month of the year, with a little extra to spare. Additionally, the odd number is not dividable, just as a strong marriage should be. Since the tradition is deeply rooted in the Catholic faith, the coins also symbolize Jesus and his 12 apostles. 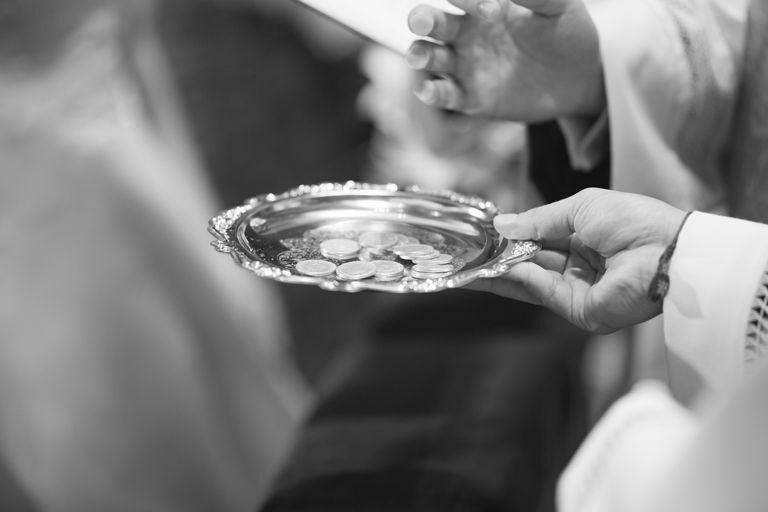 The presentation of the coins can occur anytime during the Catholic wedding ceremony, but traditionally the groom gives them to the bride after the blessing and exchanging of the marriage rings. Modern couples who wish to incorporate multiple unity ceremonies have included it after the introduction and vows but before the ring exchange. The padrino/madrina is responsible for buying the arras as a symbol of their support and good wishes for the couple's success. Most often, the padrino/madrina de arras passes the coins to the priest, which are encased in an ornate el cofre (miniature chest). Filipino ceremonies usually have an arrhae bearer, who presents the coins on a pillow, in a lavishly decorated basket or in a simple pouch. After the arras blessing, the priest passes the coins to the bride, who places them in the groom's cupped hands. The groom then pours them back into the bride's cupped hands and places the box on top. The back and forth exchange symbolizes the couple's commitment to sharing their life together, for richer or poorer. In some cultures, the coins are presented one at a time to represent love, trust, commitment, respect, joy, happiness, harmony, wisdom, nurturing, caring, cooperation and peace. The lazo ceremony, which involves wrapping a unity cord around the couple's shoulders, typically follows. Since the marriage coins become a family heirloom, it is most common for the parents or padrino/madrina to pass on their set to the newlyweds. Wedding vendors and Catholic supply stores sell a variety of arras from $10 for gold-plated coins to $200 for sterling silver. The coins are usually plain but can be etched with a special symbol to represent love, faith or the couple. The container, which ranges from a simple gold box to a crystal-encrusted heart, is usually included with the purchase of the coins. What Do the Madrinas and Padrinos Do in Latino Weddings? 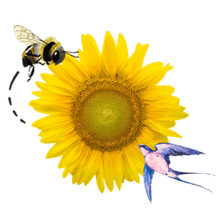 What Are Some Lucky Wedding Gifts? Should Brides Vow to Obey Husbands?